The Weather Thieves have no allegiance to days of the week or particular mountain ranges. Opportunists, they are watchers of charts, plotters of many possibilities, schemers and out and out...chancers! But a few hours window is all that is needed to sneak a fair weather hill from under the noses of the capricious weather gods. That said, filching a good day from them in ever changing February has to be the greatest challenge. We kicked their collective a***s last year, could we do it again? It was 6.30am and rain was battering down our cul-de-sac in a torrent, gurgling in the rapidly filling drains. In the circumstances you could be forgiven for thinking that this might be a very good time to stick one's head under the pillow and forget about hillwalking. I had other plans. From all the available weather reports I reckoned that this week the only spot that could almost guarantee a few hours of decent mountain weather was Lochaber, preferably north of Fort William. Being a little more fussy I also reckoned the probability of the odd glimpse of sunshine was greater in the afternoon indicating a late-ish start for myself, Cap'n Jack and The Fatdog. I had to balance a late start with a finish at sunset which meant we had to be ready to start the hill by 11am to allow us a 7 hour maximum walk. With this ever-increasingly complicated plan in mind I concluded we might have to suffer the odd shower on the initial stage of the walk, but would have any summit ridge dry. To cap it all off we might possibly be treated to a sunny walk back to the car. With the following days forecasts being poor this small window was the best we could hope to steal. 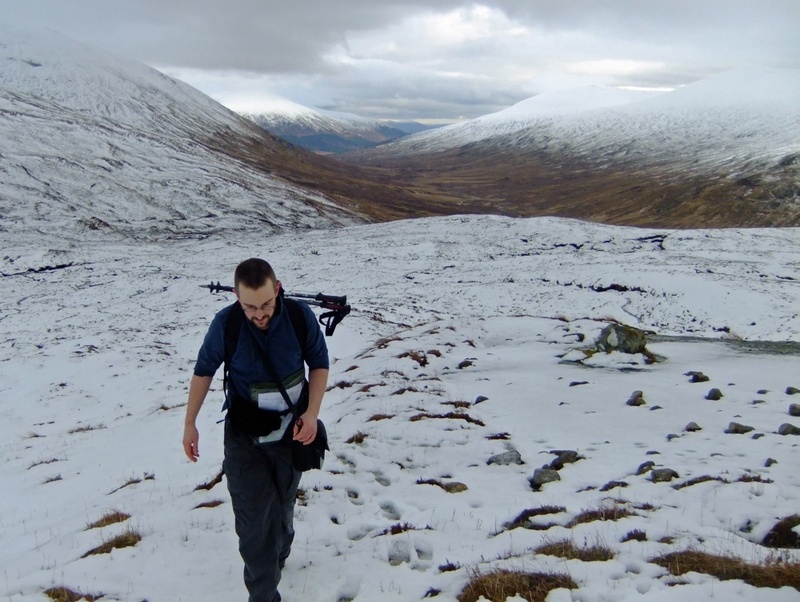 We were heading outside our normal day-range which extends, in the west, as far as Fort William so my spreadsheet was a bit thin on potential hills for this area. Luckily I had been following the forecasts for about 3 days beforehand and had already reckoned that we would have to go this far to find some decent weather. So, on Monday night, I researched 3 Ardgour and Kingairloch routes and added them to the ever expanding to-do list. The Tuesday night forecast confirmed my first thoughts. The weather would be best north of Fort William. I had one matching route - the Grahams Meall Onfhaidh and Aodann Chleireig. At 15km, this round trip would be our longest walk since the "take it easy" regime came into force last October but I reckoned it was do-able...as long as there were no unforseen circumstances. Our route would follow a track from the estate car park at Fassfern (020, 790) to the bealach between Meall a Phubuill and Meall Onfhaidh (028, 841). 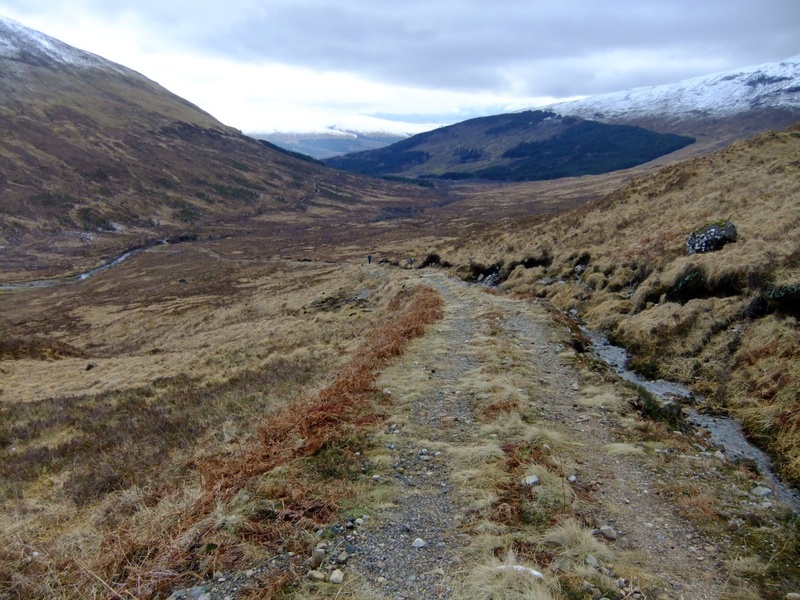 We would then leave the track and cut left cross country up the gentle east spur of Meall Onfhaidh to the summit. The second part of the day would see us descend the west spur of Meall Onfhaidh then follow the north-east spur of Aodann Chleireig. After that it would be a simple matter of following Aodann Chleireig's south-east spur back to the forest covering the lower slopes and from there back to the car park. Worryingly there was the vexed question of possible deer fence navigation towards the end of the route. For obvious reasons (canine, black and hairy...not forgetting heavy) I was keen to reach the forest before dark! It was dry! We'd dropped the rain before Crianlarich and by the time we'd reached Fort William the cloud cover was breaking up and the chance of rain was becoming less and less likely. The raggedy clouds, and there were lots of them, varied in shade from pale grey to deep dark "you're going to be really sorry" black. Perhaps we would need more than a bit of luck to come out of this one without a few moisture droplets on our jackets. The start of the track only 30m from the car park at Fassfern. The track makes for easy walking...must be fantastic in late spring/early summer. 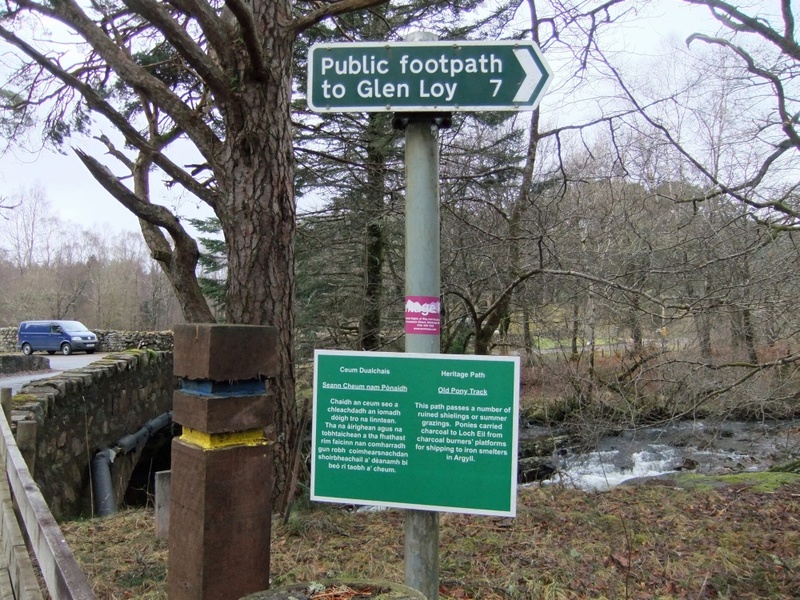 The public footpath from Loch Eil to Glen Loy proved to be a thoroughly pleasant walk beside the tree-lined edge of the An t Suileag. It could have been my imagination but I reckoned, across the other side of the glen, today's hills had a somewhat more extensive coating of snow than I had anticipated. Mind you, chances were it wouldn't be very deep. Somewhere high beyond the snow covered mountain tops the WEATHER GODS chuckled at this somewhat optimistic conclusion. Far below the distinctly unconvinced "imperceptibly loaded dice" of the Weather Thieves, having taken one quick look at the VERY threatening sky, began to spin...with no intention of stopping anytime soon. The first unforseen circumstance was our wee detour along an uncharted forestry track (roughly 021, 810) only a mile or so from Fassfern. We were lucky. From what appeared to be a dead end a dog-rough track, probably made by tracked forestry machinery, appeared to head through a swath of dense young planting in roughly the direction we wanted to go. When the "track" ran out we followed the narrow edge of a steep burn bank followed by an incredibly convenient dried up drainage ditch back to the main forestry road. We only dropped 5 minutes or so from the schedule. As Cap'n Jack disbelievingly pointed out; THAT was luck! Oh yes, the schedule. 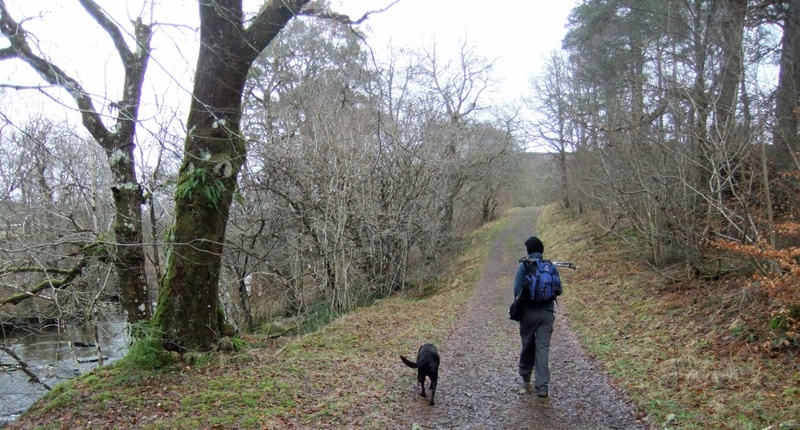 Because it was potentially a 2 hill walk with normal winter constraints of weather and time, I had made up a timeline of where we needed to be and when. This I stuck in the map case. Cap'n Jack, erstwhile custodian of said map case took great delight in pointing out some inconsistencies in my timings which, quite naturally, I put down to variations of gradient, pace and encroaching senility. By the time we reached bridge just short of the bothy at Glensulaig, on paper we'd lost the 20 minutes gained from a marginally early start. The Capn's pointy finger tapped the map case meaningfully. 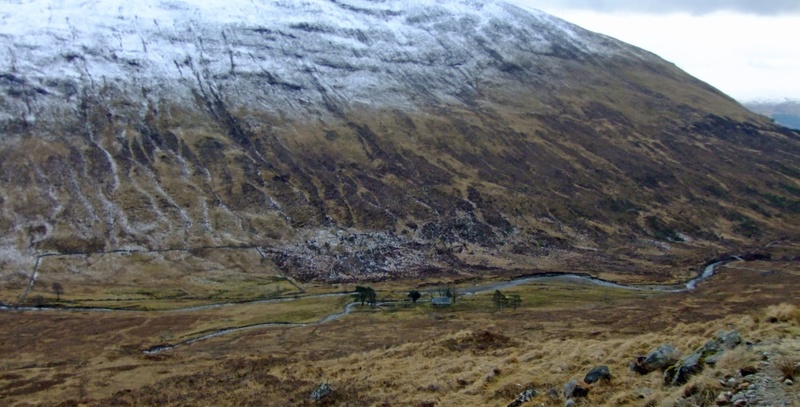 The bothy is a green pine tree oasis lying in brown-bleak U shaped valley. It's a spot that tempts you in...if you don't have a schedule! 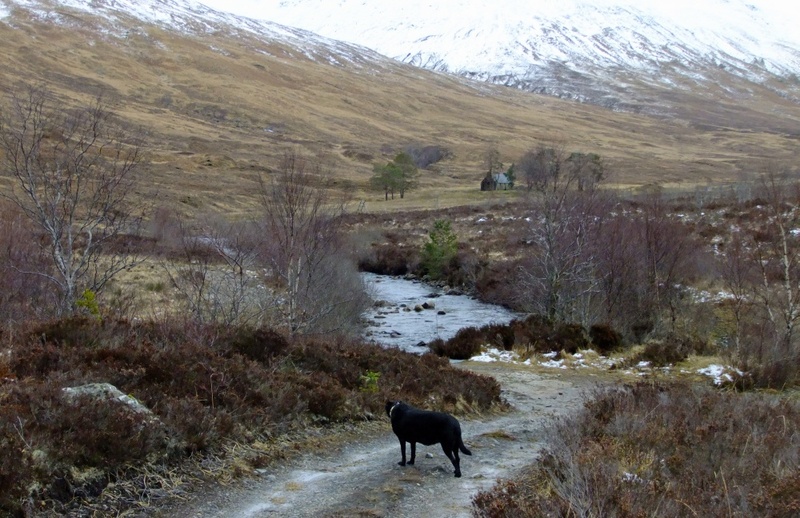 Sadly we had ours, so the exploration of Glensulaig bothy would have to wait for another day. 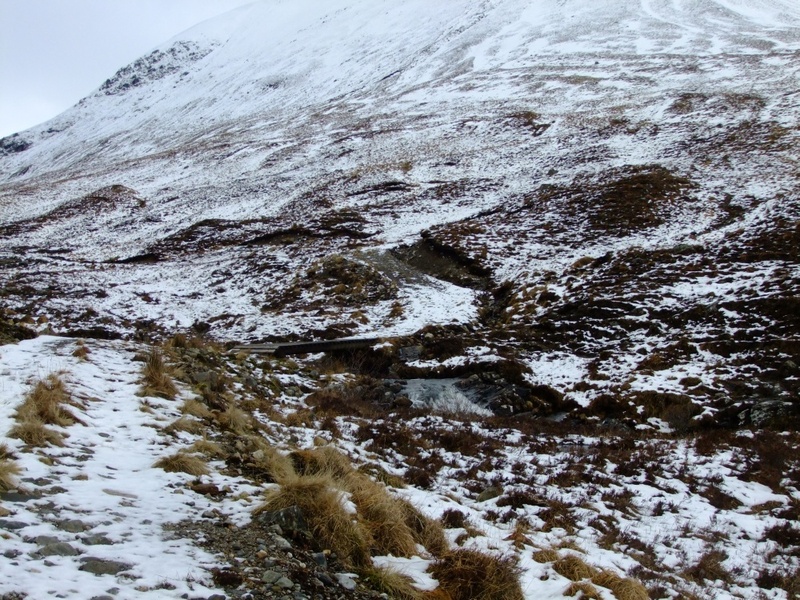 The track which had, up until now, followed the east bank of the An t Suileag, now crossed to the west and began to climb towards the bealach between Meall a Phubuill and Meall Onfhaidh. Just short of the bridge over the Allt Fionn Doire (028, 841) we began to head cross country towards the rocky east spur of Meall Onfhaidh picking up a faint ATV track heading in that general direction. We found ourselves in a dusting of soft, slushy, snow. The bridge over the Allt Fionn Doire - go to the bridge before turning left - there is a faint ATV track leading west It's also drier! 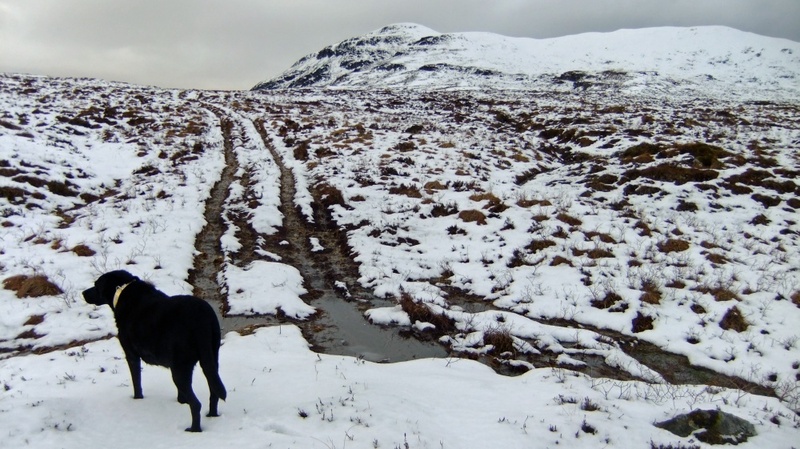 The Fatdog checks out the terrain...Meall Onfdaidh is in front - the summit is to the right. "Too much snow...too much snow...!" As we climbed the snow deepened. Unfortunately there was no consolidation so every step pushed straight through, in some cases to natural ground. One foot might go down 6", the next 12"...it was hard work. Jarred teeth and aching knees were common as heavy feet shot through the snow, occasionally hitting random scree below. I hadn't reckoned on this much snow. Cap'n Jack stuck the schedule in my hand...we were falling behind. We still had a half hour's slack which was lunch, but even at that hill number 2 was looking less likely. Cap'n Jack keeps a tight hold on the incriminating "schedule". 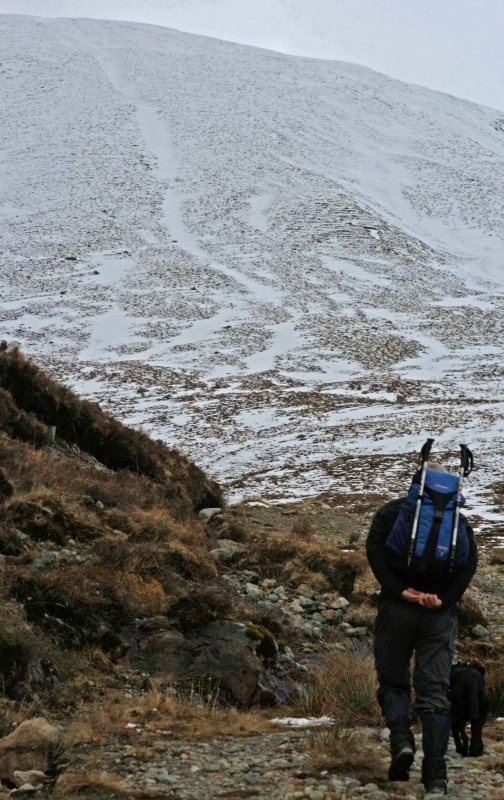 Our spur suddenly steepened and I failed abysmally to ascend a 5m "crag" through thigh deep snow. I just couldn't get any purchase, the snow being so soft. A quick traverse followed and we bypassed the wee obstacle to find that it was our best move of the day. It does beg the question why I decided to clamber up in the first place - but maybe we can just gloss over that for the moment. We were now in the hill's broad eastern corrie (roughly 019, 837), our target visible way off to our right. It was still some distance away. Had somebody slipped in a Munro when we weren't looking? We were now about 20 minutes down. Given the second hill was as snow covered as the first the schedule was now certainly blown apart. But...on the plus side...the weather was holding up well. In fact amongst the multi-shade patchwork of grey up above the odd splash of blue was appearing. Yep...the snow is definitely getting deeper. Right behind one of those small patches of blue, a small crowd of curious WEATHER GODS had now formed and was watching the proceedings with some interest. "I recognise them now! Remember...last year! Drove that little pipsqueak...what was his name..."The Minor God of February Sunshine", that was it...drove him mad they did!" "Chancing their puny little arms...eh. Good on 'em!" "Wonder if they've seen that cornicing just above those crags?" The "imperceptibly loaded dice" of The Weather Thieves suddenly stopped mid-spin, peered upward towards that hazy line between snow and grey sky...then quickly rearranged its spots into the crash position. 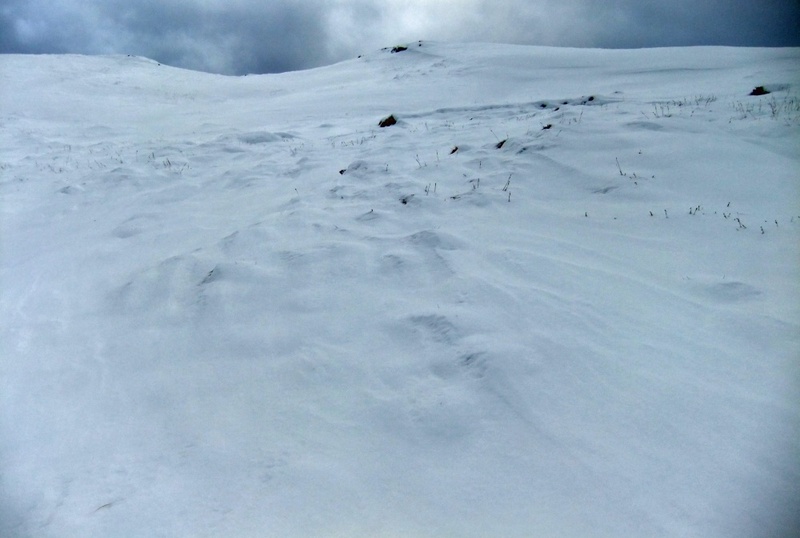 I found myself staring in some concern at the strangely shaded waves of snow above the minor crags on the slope above us. Other than the occasional variation due to near surface rock the spur formed a relatively shallow 20 deg slope, but we were crossing the zone where the hill shape changed from convex to concave. That meant that 50% of anything that was going to come down - was going to come down in our direction. There were no obvious shear planes in the snow where we were, but above us that might not be the case. With the dull snow horizon and flat grey sky blending in we were part way across the corrie before noticing this unexpected wee problem. We pressed on, one vary eye on the slope above. The snow deepened. I really thought there would be less snow near the summit ridge...WRONG! Tired of wandering through tummy-deep snow The Fatdog begins to dig her way out. Seen from above the snow build up on the spur was pretty insignificant and if it had moved would only have resulted in a minor trickle. Nonetheless it was a salutary lesson in awareness. 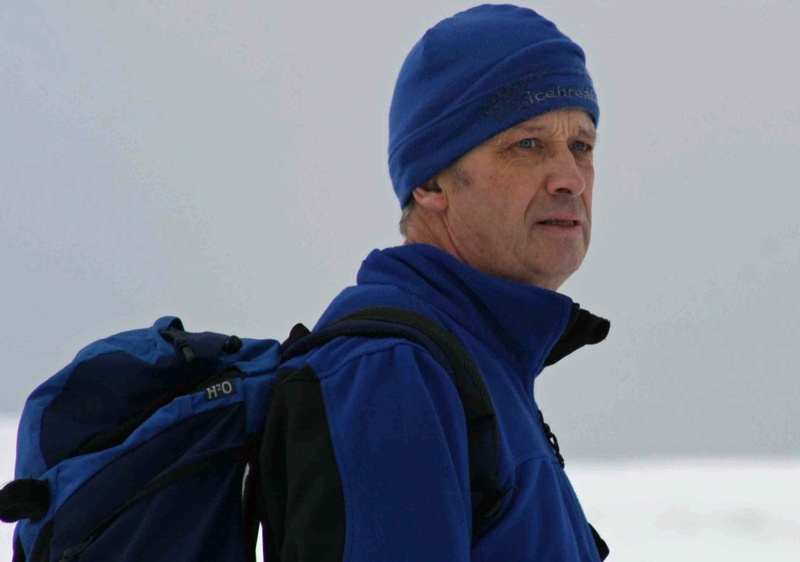 As we began to curve northwards to the summit ridge the increasingly uniform white of the snow and pale grey sky was playing havoc with my sight. Multicoloured waves swam in front of my eyes. I lurched down an unseen 2' drop shuddering to a halt. We were still some 500m from the summit cairn. 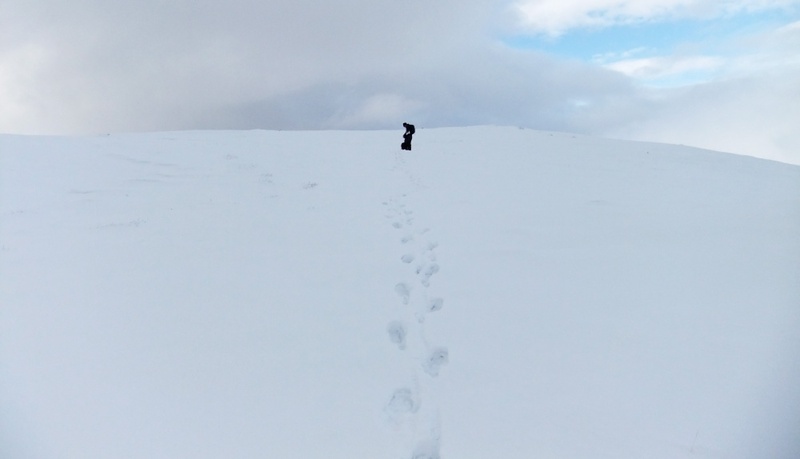 My legs had taken a severe pounding as my feet failed to find an even depth of step in the snow. The snow deepened further. The Fatdog was almost swimming through it. My right calf muscle started to twinge. I checked the watch. We had used up our slack and were still short of the summit. Hill 2 would not be happening. This face is definitely thinking - no second hill! 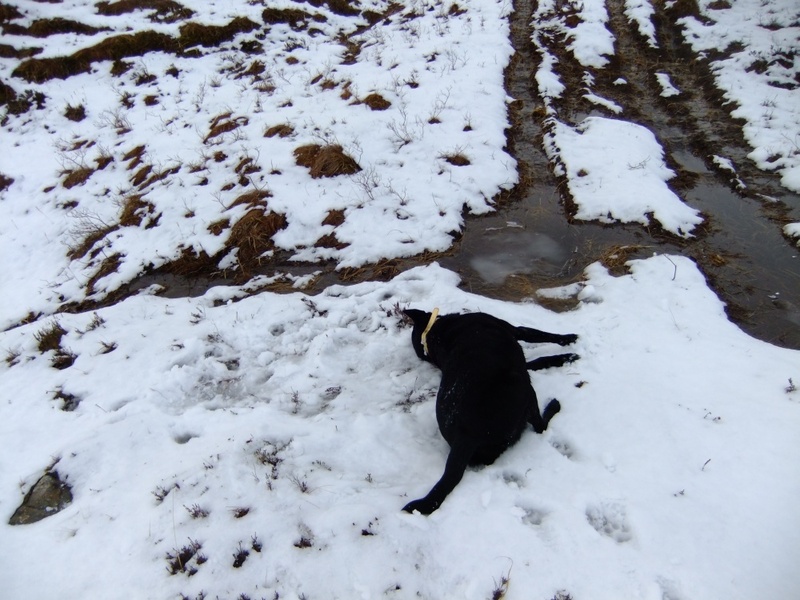 As the snow deepened to some 18" Cap'n Jack took over breaking the trail as my legs began to flag. 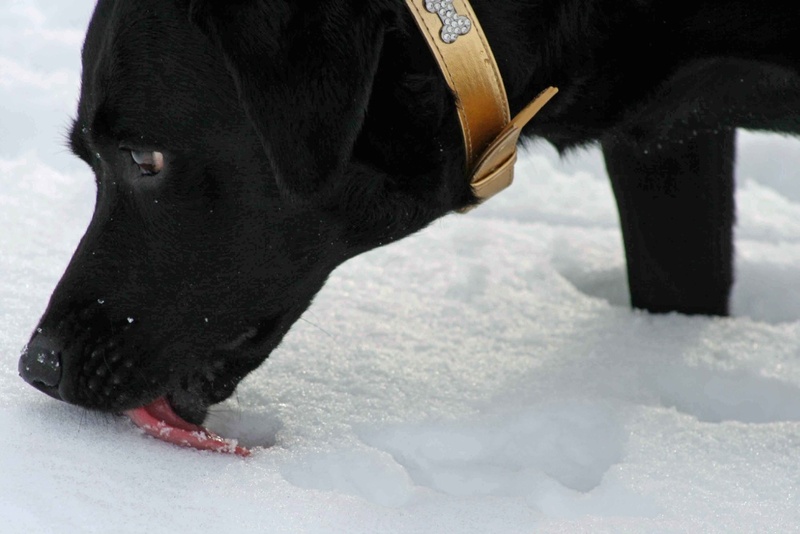 Soon he was 20m in front with that most fickle of beasts, The Fatdog, bounding after him through (to her) waist deep snow! And I was worried because I thought she'd be tired by now! The final push...at least for some of us. 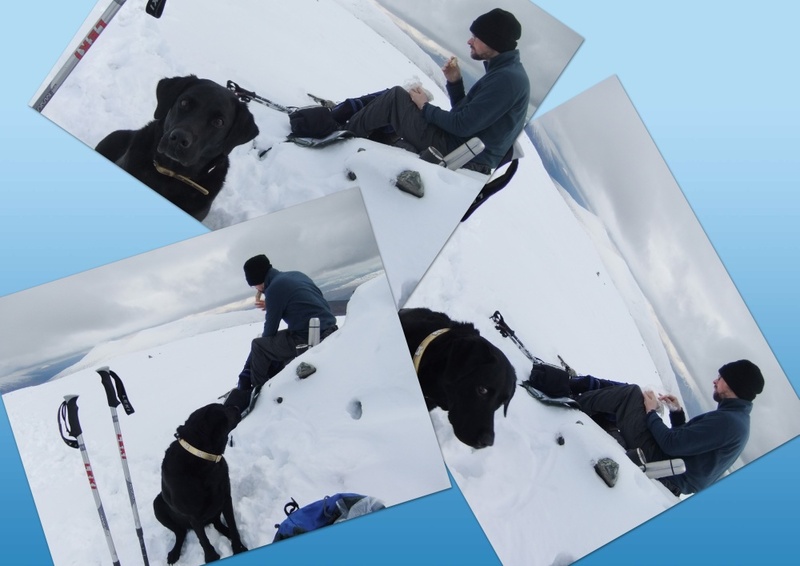 With almost no breeze to speak of we had our lunch at the summit...so did The Fatdog...have our lunch that is (sigh). 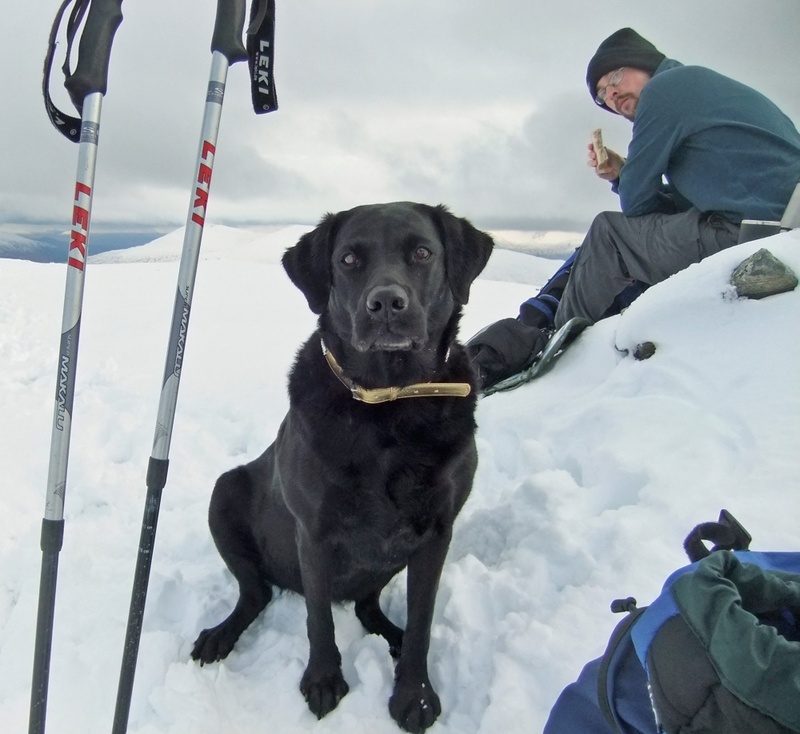 After salvaging what food we could after the pack-monster had taken more than her share we relaxed and took in fairly decent views of most of the surrounding mountains other than Gulvain, the Munro to the north, which had for the whole ascent been wrapped in cloud. Well...we had done it again! The Weather Thieves had unexpectedly grabbed clear summit views from a day which started out pretty dodgy to say the least. It was time to choose our route back. Although not the shortest, we opted to return the way we had come thus avoiding possible conflict with trees, deer fences and river crossings. THE WEATHER GODS were impressed. "Kicked our a***s just like last year, they did!" "Damn fine show...great sports!" bellowed the Demi-god of Random Minor Avalanches. "Eh...anybody seen my sandwich...it was here a moment ago?" "Oh no!" "How did it...?" The imperceptibly loaded dice of the Weather Thieves slipped out of its pocket and rolled off down the track leaving the Weather Thieves to face the not inconsiderable wrath of a slightly peckish immortal...on their own! Tweaking the noses of the WEATHER GODS was one thing; pinching their lunch could be construed as heresy...and heresy meant hellish dark clouds and thunderbolts. As she chomped her way through the remains of the cheese and pickle sandwich she'd - "found in the long grass", The Fatdog considered the day a reasonable success. The Broken One hadn't broken any further which meant she might manage to bag another few of those summit snacks. It hadn't rained and taking them down the wrong track earlier in the day had ensured she didn't have to do that second hill. Anyway it was a silly idea 2 hills, especially when they would only stop for lunch...once! "Hmmm..." she thought, "...that's a hellish dark looking cloud coming our way." 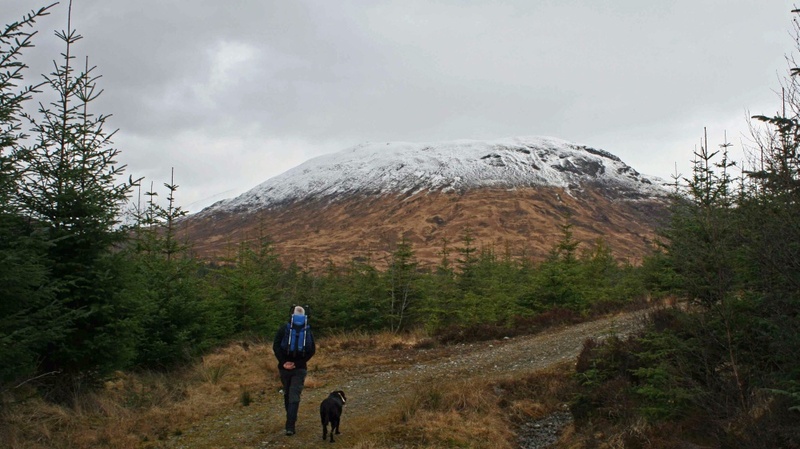 Meall a Bhuachaille - "The Fatdog in the Forest"